Cherry MX Red "quiet" Switches with low activation force and reduced noise, perfect for an office environment. Award-winning split design that can be adjusted to accommodate all body types and preferences via adjustable split, splay, and tent (tenting accessories sold separately). new cable storage compartment supports up to 20" Of separation when you need it. 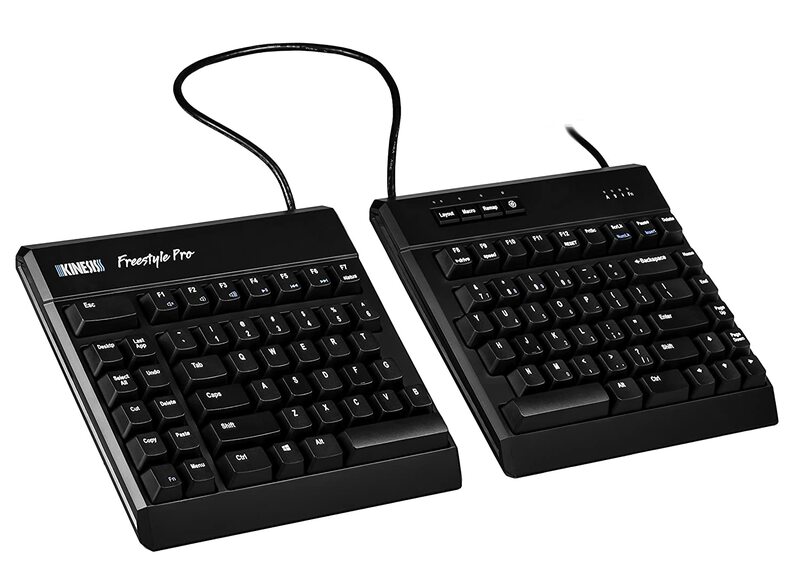 Fully programmable with kinesis’s all-new Smart set programming engine that allows you to customize the keyboard's layout without installing any clunky software or special drivers. Remap keys and record macros on-the-fly, or launch the No-Install smart set App GUI (Windows & Mac) to customize one of 9 layouts. Usb plug-and-play on windows, Mac, Linux, Chrome Operating systems. 4 additional Mac keycaps & keycap puller included. Available accessories: VIP3 Pro & V3 Pro for tenting, detachable Palm Supports, cushioned palm pads (sold separately).